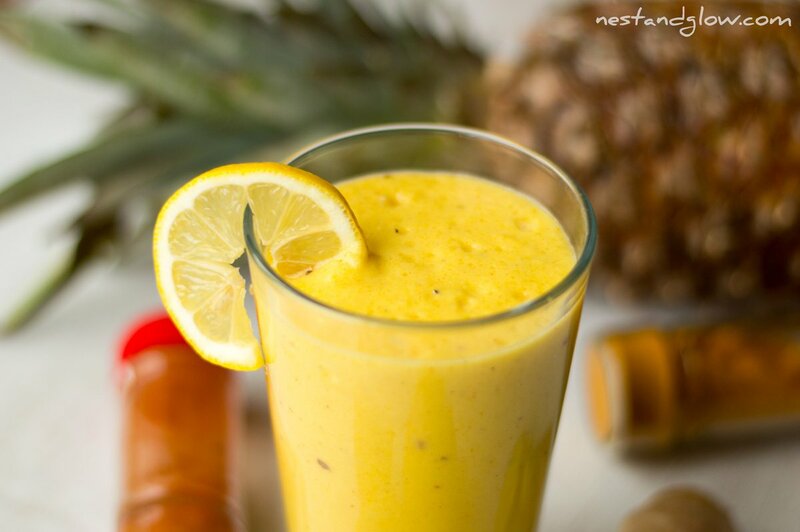 This quick and easy smoothie contains pineapple, lemon, ginger, turmeric and cayenne pepper. All have medicinal benefits and can help soothe a sore throat and reduce mucus. The tasty smoothie coats the throat to sooth and has anti-inflammatory properties. Pineapple has been shown to break down mucus with its enzyme bromine and fight bacteria. Cayenne pepper contains capsaicin that acts as a pain relief and ginger that is good for anti-nausea. These are just a few of the many proven health benefits of the ingredients. The recommended dose is half a cup three times a day but as it’s just fruit and spices you can have as much as you need (within limits of normal smoothies) without any side effects. Peel the pineapple and lemon. Place all in a blender and blend until desired consistency is reached. Enjoy straight away and store any remaining in the fridge. If you are not drinking all of this immediately I recommend to pulse blend and leave a bit chunky as it will oxidise slower and retain more vitamins. Always store in an airtight container in the fridge and consume within 24 hours. To aid digestion and absorption you should chew this smoothie rather than just swallowing. The exact amount to chew varies by experts but many suggest to chew 8 or so times until it warms to body temperature. If you are very unwell with a cold or flu and cant face chewing then just swallow normally. I peel the lemon for this to retain the pith that is full of goodness. Many people commented that my Tropical Lemon Cake wasn’t edible due to a seed going into the frosting in the video. However lemon seeds are perfectly safe to eat and have some health benefits. They contain a small amount of salicylic acid – the main ingredient in aspirin. So if anything will give some relief from aches and pains! The peeling of the ginger is optional. I did it just for the video and photos as I know bits of skin would make it less appealing, pun intended! I peeled the very outer layer using a spoon as many of the nutrients are next to the skin. If I was making this and not filming it I wouldn’t peel the ginger. 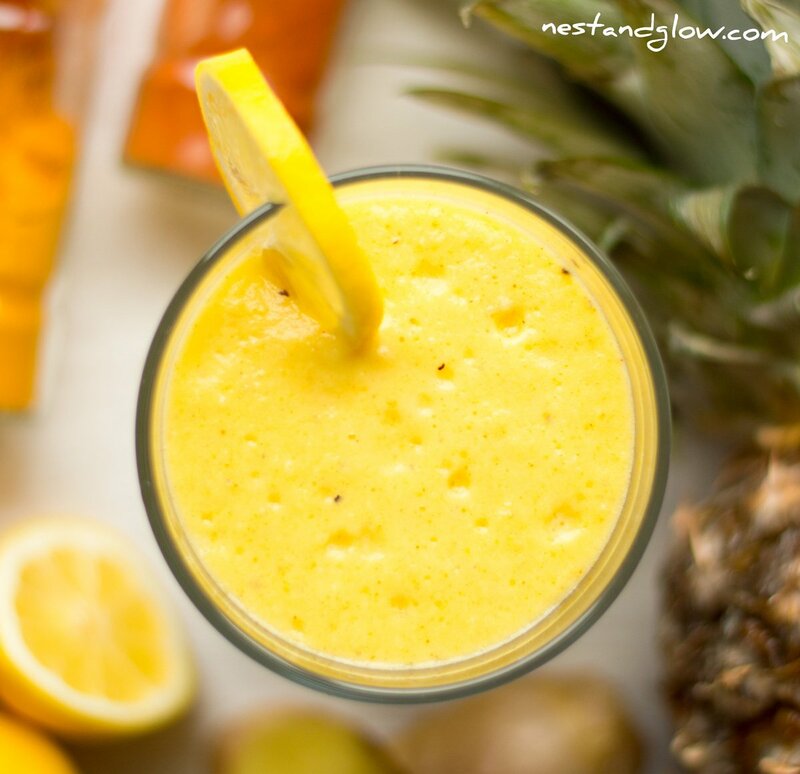 Raw pineapple juice is superior nutritionally to the pasteurised and concentrated juice that shops sell. It is easy to make and it looks delicious.